Desert Palms Emu Ranch emu oil is a natural aftercare alternative for piercing and tattoos, fully refined using a non-chemical process to remove impurities. THIS PRODUCT IS NOT VEGAN OR VEGETARIAN. Emu oil is a deep penetrating, highly moisturizing nutritional supplement for your skin. Emu oil does not clog pores which allows the skin to breathe during the healing process. Emu oil is rich in essential fatty acids that feed the skin to aid in new cell development that promotes faster healing. Emu oil is also used to lessen or eliminate keloids and reduce recent scarring. Massage emu oil daily to area 2-3 weeks prior to stretching to keep skin moist and pliable. Apply emu oil on new jewelry before insertion to ease glide. 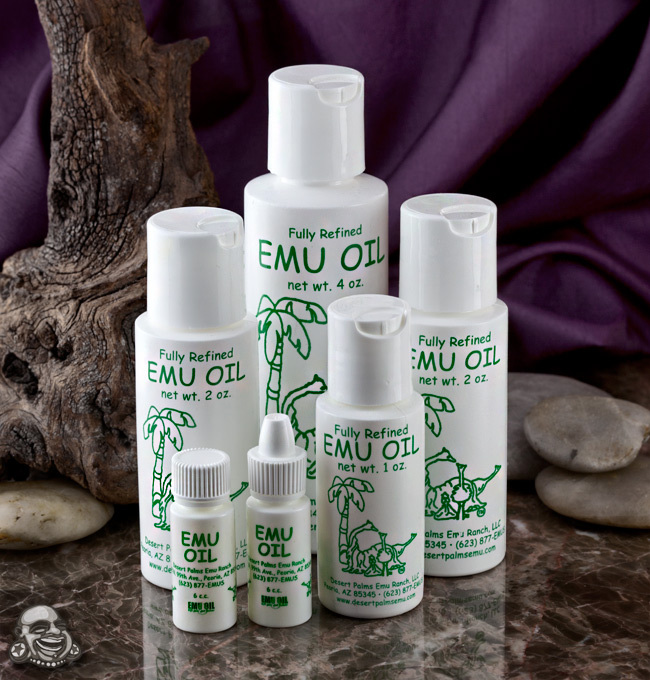 Emu oil helps to strengthen skin and can prevent tears or blowouts. Apply emu oil 2-3 times daily after the piercing has been cleaned. Gently massage a single drop of emu oil around the piercing (entrance and exit) with clean finger. Apply emu oil after new artwork is cleaned to relieve discomfort and reduce inflammation and redness. Emu oil will help set colors and reduce plasma oozing. Using emu oil 2-3 times daily on clean area will help keep artwork moist and reduces or eliminates the flaking and/or scabbing that often occurs. PLEASE NOTE: Attention international customers: Due to the fragile/large nature of this product, it needs to be shipped in a box rather than a bubble mailer. This will increase shipping costs at checkout.This item requires priority mail shipping (USA only) or UPS shipping due to its weight, fragility, or odd shape. Free shipping is excluded from this product.